As we ferry out of Oban Bay, the sky opens and rain thunders down. The droplets are so huge they force many a passenger to scurry for cover. Though it may be true that the rain is part of the allure of these isles, I’m relieved when the clouds fall away and glistening rays of sunlight outline for us the picturesque Sound of Mull. The ferry ushers us west across Mull where we must take a bus to Fionnphort, then depart by tug to the Isle of Staffa. It is here that we board a passenger only ferry to the small 5.5 kilometer Isle of Iona. Upon disembarking onto the pier in St. Ronan’s Bay, it becomes quickly apparent that you are in a place that deserves a sense of deep reverence. The main road leads past an old post office to the crumbling remnant of a 13th century convent. All that remains today are the chancel, nave and parts of the chapel roof. Iona holds historical and spiritual importance out of proportion to its size, for it was here in 563 AD that the Irish monk Colum Cille or Columba, founded the Abbey that would become the home of Celtic Christianity. Like many before him, Columba was seeking an island haven as base for his community of ascetics. This small grass covered rock that seemingly crumbled loose from the west coast of Mull became the first Christian settlement in Scotland and a place of spiritual power for centuries to come. With his twelve companions Columba set about building Iona’s first church, made of clay and wood . It was written that Columba had great physical and mental strength, garnered thorough religious training, and had become a persuasive speaker with a ‘genteel touch’. He was greatly beloved, if not a little feared, by the increasing number of followers who began to spread the Christian message amongst the settlers of the adjacent isles. Columba brought his spirit to bear on all he met during his extensive travels and ministry, resulting in Scotland’s embrace of Christianity. Nothing of Columba’s original abbey or settlement buildings now exist on Iona. However, to the left side of the Abbey entrance a small roofed chamber can be seen, believed to be the site of his tomb. Columba died on Iona on 9th June, 597AD. St Columba’s biography was written a over a century later by the Irish monk Saint Adòmnan. Adòmnan died in 702AD, having been made Abbot of Iona in 679. The earliest surviving building on Iona is the Chapel of St. Oran, erected as a family burial chapel in 1100 by Lord Somerled, Lord of the Isles. The burial grounds nearby, known as Reilig Odhrain, are rumored to contain the relics of 48 Scottish kings including Macbeth, Robert the Bruce and Duncan I. Beyond the north wall lies the “Street of the Dead,” which leads to the Abbey. In front of the west door stands a carved cross commemorating the 4th century bishop Martin of Tours. Tucked behind St. John’s Cross is St. Columba’s Shrine. Once inside, the church reveals itself to be brighter than you might imagine, and features a prayer corner, and an effigy to Abbot J. MacKinnon. Passing through to the cloisters, warm sunlight caresses the arches of perfectly manicured stonework on which hangs a feeling of the centuries in the air. It is not grand like the great cathedrals, but is surrounded by an aura of truth rather than pretension. It is solemn, humble and aged. The soft afternoon light gives the Abbey an earthy glow, polished by centuries of weather, love and the faith of all the silent witnesses who’ve prayed there. About one hundred and twenty people live on Iona year round. Some have been here for several generations, while others arrived recently to build a life on the island. Work on Iona is divided between crofting, (raising cattle and sheep) and tourism-related jobs in catering, and hospitality both on land and by sea. A number of craftspeople make unique, individually designed goods for sale in Iona’s shops and galleries. The population is boosted to around three hundred in summer, as people take up summer jobs or volunteer placements in the Iona Community. Iona’s primary school has around ten children enrolled. For secondary education, pupils go to Oban High School, and stay as weekly boarders in the Oban school hostel. Within the local community of Iona there is the interfaith Iona Community founded in 1938 by the Reverend George MacLeod of Fiunary. The Iona Community describes itself as ‘an ecumenical Christian community of men and women from different walks of life and different traditions in the Christian church’. Membership of the Community comes mainly from the UK where residential staff maintains quarters and work on Iona. They are supplemented by seasonal or longer term volunteers. Many individuals and groups share in work and worship at the Chapel on Iona. The Abbey and The MacLeod Centre are staffed by the Iona Community, as is Camas, an outdoor adventure centre on nearby Mull. 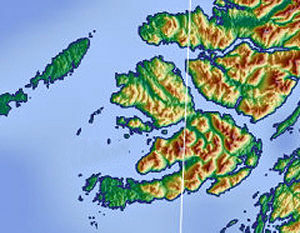 The island of Iona is now owned by the National Trust of Scotland. The island was given to the National Trust in 1979 by the Fraser Foundation in memory of Lord Hugh Fraser of Allander. The Fraser Foundation had purchased Iona from the Duke of Argyll.